In 1882, the Hotspur Football Club was formed by a group of school boys attending a Bible class at All Hallows Church. Tottenham’s aim early on, like so many clubs was to join a league and win it, and so they were interested in the attempt by Woolwich Arsenal to form a Southern League to rival the northern based Football League in 1892. Indeed there was no reason why they should not apply to join the league – along with 21 other clubs, which they did. But Tottenham had the ignominy of being the only club not to get any votes. Which suggests either that between 1882 and 1892 Tottenham had remained totally obscure, or else they had managed to annoy the rest of football in the south so much that everyone hated them. I’ll pull all this together in a moment and give an answer, but we may note to start with that whatever the reason, Tottenham’s longer term development was not hindered for they went professional at the end of 1895 and joined the Southern League. In 1900, Tottenham won the Southern League title and in 1901 the FA Cup, but despite the fact that other London teams such as Chelsea and Clapton Orient were in the Football League, and Woolwich Arsenal from Kent were also there, Tottenham did not get admitted to the Football League until 1908, when they came in and won the second division. So again we have an interesting situation. Tottenham, with great success, ruling the Southern League, winning the FA Cup no less (and lets not be churlish, this was years before Arsenal even managed to get to the semi finals,) could not get out of the Southern League and into the Football League. Again, why? Even Clapton Orient got in, when they didn’t. Here’s another drop of history and it is this which starts to give us the idea. Tottenham were relegated in 1919 when Arsenal were promoted. Tottenham argued that although they had ended up bottom in 1915 (the previous year of the league) the league was being extended by two clubs and precedent would mean that they should stay up with the top two in division 2 being promoted. This plea was rejected. Again, the League did Tottenham no favours. Again, why was this? Why did Tottenham get zero votes when they tried to join the Southern League in 1892, why did it take so long for them to join the Football League despite some early success and why did they get kicked out of the first division in 1919? What had everyone got against them? I think the answer is to do with attitude, style and approach. In essence the rest of football really didn’t like Tottenham very much because of their behaviour. Let’s go back to the very name Hotspur. Tottenham found a playing area near Northumberland Park, an area which by repute was owned by the family of Sir Henry Percy, alias Hotspur, made famous by Shakespeare in Henry IV. (And remember we are talking 15th century history here – not present day stuff). The name Hotspur was a powerful name – it was a name that had come to symbolise British strength and determination, plus flamboyance, risk taking and the like. (Actually history paints a different reality, but this is how the word “Hotspur” was seen in the late 19th century). But London already had a Hotspur club that laid claim to an inheritance of Sir Henry Percy – London Hotspur. The Percy family lived at Syon Park, which is south of the river, and that is where London Hotspur played. What Tottenham were doing in adopting this name was several things. Firstly they were trying to find a romantic link through the Northumberland Park region to the hero Harry Hotspur. Second they were trying to take the name of the club London Hotspur, who themselves were getting a reputation. Third they were trying to give themselves instant fame, an instant reputation. It would be rather like a club newly formed at the time of the death of Winston Churchill calling itself Tottenham Churchill. Popularist but ultimately a bit of a cheek. The Duke of Northumberland’s family, who are the descendants of Harry Hotspur had not direct claim over the name “Hotspur” but they would undoubtedly have been concerned to see a general use of the name here there and everyone. One club, London Hotspur, playing by their ancestral home, perhaps with permission to use the name, might be one thing. But suddenly another one turning up, would be something else. How many more “Hotspurs” would arise? One can imagine them getting irate, and writing a letter. Legend has it that a letter was indeed received at Tottenham, which caused them to change their name from Hotspur FC to Tottenham Hotspur, although the legend now says it was a wrongly delivered letter – intended for London Hotspur. I believe this to be highly unlikely, for the simple reason to the club which was to become Tottenham Hotspur was not in London at the time – and in fact was not in London for a very long time to come. The chances of a letter for London Hotspur, from Syon Park, south of the river, ending up with a team not even in London is too remote to give credence to. Tottenham (which incidentally was where I grew up as a child, living in Devonshire Hill Lane which runs parallel to White Hart Lane) was part of Middlesex from 1850 to 1965. True, it was part of the London postal area (London N17) and the Met Police District, but in terms of administration and local government it was in Middlesex, not London. In 1934 the urban district was incorporated as a municipal borough (still part of Middlesex) and it was only when this was abolished in 1965 following the London Government Act in 1963 and it became part of the London Borough of Haringey. These facts were discovered by readers of the Woolwich Arsenal site “Making the Arsenal” and I am very grateful to them for the discussion which brought this to light. So Tottenham Hotspur were formed, but they were already known as a club that pushed its luck, usurping the name “Hotspur” from another club, already using that name. That explains why they started getting rejected from early ballots for entry into leagues. But then Tottenham made matters much worse for themselves. In 1905 when Chelsea was created out of nothing (see the special feature article on this topic) they (Chelsea) applied for a place in the Southern League. And Tottenham Hotspur objected on the grounds that London already had too many clubs! Now that was cheek and a half. Tottenham had no right to speak on London, because it was clearly in Middlesex, not London. Woolwich Arsenal (in Kent) made no such objection. It was widely seen as the uppity Middlesex club sticking its nose into things again. However Tottenham made so much fuss that Chelsea was rejected by the Southern League, with support from clubs like Brentford, and Croydon Common. So Chelsea applied for a place in the Football League and got in. But the Football League would not forget Tottenham’s negative and arrogant behaviour in trying to speak for London, so from then on , no matter that they had won the cup, they were kept out of the League. Norris made the point that if the Football League were to be a national league, then the capital – the real LONDON – not the adjacent counties – needed football teams, and at that moment it only had Chelsea. Adding Arsenal to the list would at least give London two – as Middlesex had two (Orient and Tottenham). This is why Tottenham, the Middlesex club, had no friends in 1919 when Arsenal applied for a place in the first division to represent LONDON. Tottenham claimed that by coming bottom in 1915 they should have stayed in the 1st division when it was expanded. But on what grounds? Their only grounds were the fact that they were NEAR LONDON. That was it – and indeed when Tottenham Hotspur make references to Woolwich Arsenal, we should always remember, they endlessly tried to manipulate London football from without – and that is why the Football League lost patience with them, and told them to shut up. Woolwich Arsenal could become Arsenal, and Arsenal could have their place in the 1st division. Heart warming story this. Stoking up the old animosities gives me a smile after last night’s Barca game. There’s an interesting sideline to this in how the spuds (I refuse to use the T word in case kids are reading) got into the league and how lucky they were to do so. In 1908 they left the Southern League (with some acrimony as the Southern League ‘demanded their resignation’ which left them without a league to play in unless they were voted into the Football League. When the votes were counted Grimsby Town (32 votes), Chesterfield (23) and Watford (20) were duly elected with the following failing: Lincoln City (18), Spuds (14) and Burton United (1). Then they had a second chance when Stoke City resigned through ‘lack of support’. A Special General Meeting of the Football League was called to fill the new vacancy and Lincoln City, Spuds and (rather strangely) Stoke City all stood. the first vote gave Stoke 6 votes with the balance of the 40 votes shared. A second vote (minus Stoke) came in at 20 all, as did a third vote which left it to the Management Committee to decide, and they voted the Spuds in by 5 votes to 3. One other thing that I’ve heard once or twice but have no way of knowing if it’s true or not is that one of their first grounds was on the un-football sounding Pink Lane and that they played in pink shirts. Just one thing to clarify please, (I’m an Arsenal supporter), I thought that the Middx ‘border’ in those days actually extended down to the river, so Highbury was also in Middx? So how did they come to be called to be representing London if that’s the case? Mark the border of Middlesex went south to Tottenham. After that London started. So Highbury was always in London from the moment Arsenal arrived, but Tottenham was not until much later. Not that it makes much of a difference to your central point, but if it is the same Syon Park I am thinking of, then that is north of the river. It is very near Brentford, which I know is a club with some history. I am also pretty sure it would have been in Middlesex until quite recently. The Name Hotspur was already in place before the formation of the Football club.We were founded by members of Hotspur Cricket club,so kills that little conspiricy theory.Also, we were formed by13,14 and 15 year old school kids not grown adults (as is the case with you,west Ham etc) do you honestly think they looked into it that deeply? A reply to this guy tony would be great. Might change an integral part of the story. Hmmm, interesting. I can’t help thinking, however hard the writer of this article has tried, that there is a definite Arsenal slant to the content. Those damned Spurs! Depends on whose version of history/opinion you’ve read and believe. I doubt that the real underlying reasons (whichever they may be)for inclusion/exclusion have ever really been documented. Who really cares? We are where we are and now only have to contend with the hypocrisy and double dealing of FiFA! I’m wondering if you can help? Your website illustrates the existence of an older Hotspur club. A spurs aquaintance of mine is convinced that the existence of a earlier Hotspur club is an urban myth. Are you able to shed any more light on the existence of this older Hotspur club? Where did you find the information about this club? Are there any records about them? Pete, you will appreciate that I am of course an Arsenal fan, and have not bothered to look closely at Tottenham’s history save where it crosses Arsenal’s. The statement that there was a club called London Hotspur, and that Tottenham H adopted the name “Tottenham” in order to avoid confusion with London Hotspur is on at least a dozen sites from the BBC to Wikipedia (http://en.wikipedia.org/wiki/History_of_Tottenham_Hotspur_F.C – see under “formation”. The fact that the language is virtually the same in all cases, and there is a real lack of further information, leads me to believe that all this comes from one source – which of course makes it suspicious. But that doesn’t make it untrue – there are a number of “facts” in Arsenal’s history which come from a single source, and it is a devil of a job to try and verify them. If there truly is nothing else anywhere apart from one person saying making this statement then I guess it is a 50/50 choice. In a sense teasing the truth out of such issues is what we do here – maybe your friend should set up Tottenham’s own version of this site! Thank you Tony for your prompt and honest reply. My ‘aquaintence’ is still far from convinced however. If anyone can shed anymore light on this topic, it would be most gratefully recieved. Thanks again for a brilliant website. Following a debate on a well known football forum, where several Spurs fans refused to admit that there was another Hotspur club that pre dated THFC. I decided to do some research. I contacted the author at Historical Kits to ask where he had got his information from about ‘Hotspur FC’, he replied that the information had been supplied by the official THFC historian Andy Porter. The addition of Tottenham to the Hotspur FC club name was adopted at the second annual general meeting of members, held on April 2, 1884. In fact, there was no London Hotspur club, the other club was also known as Hotspur FC, the name adopted during 1882 by the schoolboy founders of THFC, from the Hotspur Cricket Club (founded 1880). According to Mike Collett’s book “The Complete Record of the FA Cup” (Sportsbooks, 2003), Hotspur FC were formed during 1878. They entered the FA Cup for eight seasons between 1879-80 and 1887-88, reaching the fourth round (last 16) during 1881-82. A THFC correspondent whose great-grandfather played for the other Hotspur FC provided copies of his membership cards for seasons 1886-87 and 1887-88. These confirm that by September, 1886 the other Hotspur FC were playing their home matches on a ground at Merton, Wimbledon, Surrey, adjoining Merton Hall Farm, near the “Leather Bottle”. Dressing room was on the ground, about a quarter of an hour’s walk from Wimbledon Station (L. & S. W. Ry.). Club colours were listed as Dark Blue Shirt, with White Maltese Cross on the left breast; White Knickers and Dark Blue Stockings. Their Hon. Secretary, a Mr. W. H. Harding, was based at 150, New North Road, Islington, N.
Their fixture list for 1886-87 has matches scheduled for their first, ‘B’ and ‘C’ teams, including a visit to Tottenham where their ‘B’ team (reserves) faced Irmac on October 16. Between December 27 and 30 they played at Burnley, Derby County and Sheffield Wednesday. Their ‘B’ team was due to play at Tottenham Hotspur on February 26, 1887. Only two teams, first and ‘B’, were run by Hotspur FC during 1887-88. All of their matches were within London and the south east. The other Hotspur FC are believed to have folded by the mid 1890’s. Lots of complete drivel on this article. Take for example the following…. You try and make it sound as if Spurs were trying to get into the Football League all this time. In fact they weren’t. Nor were many Southern League clubs at that time. Clapton Orient got in when they had finished 8th in the Southern League Division Two, behind six teams who were the reserves of Southern League Division One clubs!! Prior to 1907 the only other club that applied to join the Football League was Bristol City. The first team to have done do as Southern League champions were Fulham in 1907….by this time the Football League was beginning to establish itself and Spurs application went in the following year along with Bradford’s. And that was it until after the First World war. Apart from Huddersfield, the normal procedure for the League if not re-electing a team was to replace them with a team that had previously failed to be re-elected (thus Lincoln were back in after a season….then back out….then back in again). Quite simply, prior to the season they actually joined, Spurs did not apply to join the Football League. They were in a league considered just as strong with the benefits of not having to play all their away games many miles away in the football League, which apart from Arsenal, was a regional league of Northern and Midland clubs. The fact that Arsenal were doing this nearly made them bankrupt and forced them into voluntary liquidation….which is how the crook Henry Norris came into the picture. Timmy, there is much in what you say, and indeed many of the articles on this site explore these points. I won’t argue with you on this. Indeed I will openly admit that this is an Arsenal site, and history here is written through Arsenal eyes, and in some articles I get carried away. The forthcoming book on Woolwich Arsenal, which has the benefit of using all the articles here, and the many comments that have been made, is, I believe, a little more balanced. But as you are very conversant with the period, you will also know about the several attempts to form the original Southern League which failed, before it happened. In these Tottenham, despite being a club of distinction, got low numbers of votes – indeed from memory I think that in the first attempt to form the Southern League they only got one vote. What I have always wondered is why this was. If you know why Tottenham failed to be accepted by the other clubs at this point, I would be glad if you would let us know – or indeed if you know of a history book that explains what happened, that would be good. Just one detail I would argue – and indeed we have been through this to some degree on this site. Arsenal did not get into financial trouble in 1910 because of being in the league. They had after all been in the league for 17 years by then, and one would have thought that if travel expenses were the real problem, they would have suffered that sooner. The fact is that they attempted to work the transfer system to their advantage, having seen the doubling of transfer fees each year for around 10 years. But after 1906, when they started this new policy, transfer fees grew much more slowly, and the policy failed. By selling off their top players in the 1906-1910 period, the club’s form declined, and without the extra income of the type generated by the two cup runs, and with the benefactor (Mr Leavey, curiously – although I recognise the spelling is different) the club had no source of money. When the local people failed to buy shares in a proposed new club early in 1910 Norris sought to merge Fulham and Arsenal into a single club – and I am sure you know the rest. Timmy, I have enjoyed reading your replies, they are well structured rather than some of the simple uninformed responses on other websites. As Tony says, this is written through rose-tinted glasses but we have tried to keep to the facts as best we can. One thing that is for sure is that Tottenham applied to become members of the Football League in 1896. The only managed two votes. This is documented in the Football League’s minutes and is not a piece of hearsay that has been passed down through the years and twisted. Arsenal supported Tottenham’s bid to join the League as they knew that if Tottenham were promoted it would be one less long distance journey to an away game. but without doubt, the southern boarder was the river! South of Middlesex was the County of London, within which was the borough of Highbury & Islington. FYI London Hotspur played at Syon park which is north of the river Thames, looking across at Kew Gardens on the southside. This is fun but I don’t think the youngsters that formed Spurs would have been as devious as portrayed as someone else said. Also, it was quite normal for clubs to join local leagues even if just outside the stated area when Association Football was starting off. Middlesex hardly existed and the only other option might have been a league for Herfordshire. Tottenham was part of the London conurbation. As were Clapton and West Ham, which brings me on to my main point. They were technically in ESSEX at the time, not MIDDX. The border for London County ran down the Lea to the Thames. Everthing to the east was technically in Essex (although it was called London in Essex or London Over The Border). Spurs was not acting any differently than they were. Arsenal were seriously driven to cause problems as they wanted to be Nr. 1 in London and stirred things up. They took Spurs place in the top flight after some jiggery-pokery. Orient also have an ongoing issue about this, and Arsenal’s move to north London. Well, not that much of an issue. Nor have Spurs really, but we still get a bit of fun out of pointing out AFC’s underhand promotion – hence this nonsense. If you lot weren’t in Middlesex why did you compete in the Middlesex senior cup? No mention of Arsenal being bankrupt before Henry Norris took over in 1910 and having to rely on Tottenham money to keep their very existence. The reason of course why Arsenal have blue in their badge in deference to Spurs. Tottenham of course also voted to keep Arsenal in the league when they should really have been relegated. You owe your records to us and your very existence to us. Harry – a very interesting assertion. The fact that Woolwich Arsenal were in financial trouble is covered in many of our articles – and indeed my book “Making the Arsenal” is centred around the financial problems. a) Norris attended the meetings with the League and guaranteed the future of Woolwich Arsenal. He then paid off all the creditors in full. There is no record that we can find of Tottenham doing anything, other than one suggestion in one paper that Tottenham were interested in buying Woolwich Arsenal. In the end Rangers bought some shares but Tottenham did not. So, your claim is most interesting, and I would be very grateful for you would post in the source of your evidence, for this is a completely new notion. I have to say I am a little surprised, since I spent 2 years researching Henry Norris and Woolwich Arsenal in 1910, before I wrote “Making the Arsenal” and that included quite a bit of research into Tottenham – following through their actions in such matters as Chelsea’s application to the Southern League in 1905, and their attempt at calling an AGM to stop Arsenal’s move in 1913. Amazed I missed it, but please tell me your source. They did purchase one share, but got rid of it after afew months. End of day Tottenham are still in their roots whilst Arsenal moved from South of the Thames and deserted their roots. As for the promotion in 1919…Spurs and Chelsea were told no relegation from the 1st Divison, pre first world war, as the League was expanding to 22 teams. Then Norris used some comments in way of a threat over Manu and Liverpool rigging a game pre war which meant Chelsea finished 2nd bottom and he demanded a vote as only the top 2 were getting promoted from the 2nd Divs. Arsenal had finished 5th yet somehow Norris thought that worthy of a chance to get promoted via the back door. Norris was known to be an advocate of hypocrisy when it came to morals and getting his way. He was eventually un done by his own arrogance when he sued a newspaper and lost over allegations he was corrupt. He also had his hand in the club till. Banned for life tells you alll you need to know about him. My Grandad, an Arsenal fan, told me the Brown paper bag tactic was loved by Norris when aquiring players illegally from other teams. Congratulations. You can recount meaningless platitudes. Well done Spud. Faction is one of my pet hates. Make up a story, or tell history as it is. Don’t mix up the two or use selective sources. What would be the point in anyone reading any of your books based your admissions on the above. I have read all of the posts on here. Conclusion – both clubs have amazing History – for the last 40 odd years Arsenal have the Bragging Rights. End. dsossie – the volume you describe went through numerous reprints and amendments – it was first published I believe in 1870. Can you tell us which edition you are quoting from. In 1882, pupils from the school and from St John’s Presbyterian School formed Hotspur F.C. at All Hallows’ Church. The name came from the Hotspur Cricket Club, of which boys from the school were members. This football club subsequently became Tottenham Hotspur F.C..>>>>>>Which became Somerset School!!! 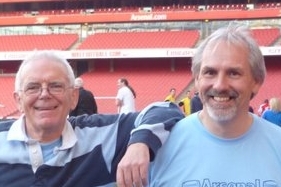 !…..Old boys be proud of your history,,gooners got no roots like we have…..Oyyy Oyyyyyyyy!!!!!! Steve Lamb – some sources for these assertions would be welcomed. I can scarcely believe this blog and I am surprised I did not stumble over it previously. Despite it being many years old I feel compelled to comment. It is littered with falsehoods and quite frankly astonishing assumptions and down right lies. It smacks of someone ashamed of something, trying to deflect from a truth. Could it be from a fan embarrassed by his club’s own history? Desperately trying to re-invent the history of his arch rivals to make his club’s own history seem valid? Firstly the “Hotspur” tag. There are numerous books on the early history of Tottenham, recent well written ones including Brian Belton’s “Forward the Spurs” (which only concerns Tottenham Hotspur from their formation to 1901) and “The Biography of Tottenham Hotspur (Julie Welch). These are the facts. Tottenham were formed in 1882 as Hotspur Football club, two years after the formation of Hotspur cricket club by local school boys. These were Victorian school boys, the Hotspur tag coming from history lessons – Victorian boys – choosing a medieval hero, who’s family also happened to have local roots. A fitting name if you ask me. Yes, there was another Hotspur both clubs were small amateur outfits but the conurbation of London was already spreading, thus Tottenham was added as a prefix to differentiate nothing more nothing less, the other Hotspur soon consigned to history. There is no evidence whatsoever of any club or organisation or the Northumberland family getting upset about the name Hotspur being used by either football club. The connection between the name Hotspur and rejections by Southern League – a pure lie. Indeed the evidence about Tottenham supposed numerous rejections is thin. Tottenham were a small club until the mid 1890s so yes they were fairly unknown and obscure – they had been formed by school boys after all just a few years previously for crying out loud – so this not surprising. However by the mid 1890s they were soon admitted to the Southern League and by 1901 had made history winning the FA Cup. Indeed by now they were widely called the “Flower of the South” and were reported as being a London club, by newspapers such as The Times. Indeed their reception for winning the cup was held in Holborn, with many of London’s luminaries attending. So this leads me onto the Middlesex question. Firstly I would start by stating that Tottenham Hotspur has been located within one mile of their formation for their entire history a truly local club, with firm roots, a club which embraced and indeed has always been part of their community. However the truth is Middlesex has not really existed as a county other than notionally for over 150 years. In fact Middlesex did not even have a county town when Tottenham were formed (not since 1789) such was its proximity to the City of London & Westminster. Indeed the Middlesex Guildhall was in Westminster. By the time of Tottenham’s formation “London” and most of Middlesex was interchangeable. Hence the reason the Metropolitan police district, postal district and other services considered to be “London” placed Tottenham firmly within their boundaries. The spread of the conurbation unabated for many years long into 20th Century. So by 1965 when Middlesex was formally axed as a county, in reality it had ceased to be anything other than a part of London for decades. Indeed the term “Greater London” had been used for many years before it formally came into being – there is mention of it in the 1901 census for example. So this talk of Tottenham being considered a “Middlesex club” is utter rubbish – dreamt up Gooners determined to pretend that they are the original North London club – indeed the funny thing about arguing about the term is that North London is an imprecise unofficial term anyway – but one thing we can be sure on Woolwich has never been considered North London – not by anybody. So moving from south to north and then claiming to be the original North London is quite frankly bizarre. Anyone would think you are ashamed of your roots! Can never work it out why people refer to Spurs as playing at White Hart Lane,thought it was Tottenham High Rd Paxton Rd etc not White Hart Lane. By the way I’m a Chester FC fan in case you need to know. Gooners bought land they weren’t entitled to with stolen money. Corrupt FA, surely not. Next thing you know you’ll be saying FIFA and Arsenal ( Russia ) are corrupt. Never..
Neil. that is a very serious allegation. Surely you should provide some evidence to back it up. Otherwise you just appear rather bitter and a little laughable. I am reminded of a quote by Spurs great Jimmy Greaves, when he had a column in the “current bun” a couple of years ago…”I would have walked over broken glass to play for Arsenal”. Nuff said! Why won’t you post my response to Tony Atwood 22nd October. Too sore? Neil……..
Neill, we get hundreds and hundreds of posts that we don’t publish each month, either because they are wholly unrelated to the topic, or else are abusive towards the writer, or they contain what appear to be statements of fact but which are presented without any supporting evidence. If we’ve stopped your post wrongly my apologies. I promise you, mine was not in anyway abusive, my post was a statement of FACT regarding the relationship between the Chairman / Owner of the South London Woolwich Club, which is you, and the Then Archbishop of Canterbury. The ONE and ONLY reason Woolwich were allowed to move their team to a different part of the Country, even though the local clergy who owned the land said NO.Let us not forget I support Chester FC,but you can’t gloss it up. Easiest thing move back to your roots and let’s have a North / South London Derby between Tottenham and Arsenal as it is now but in reality. Neil Hughes… thanks for your comments. As I was a co-author of the Woolwich Arsenal book which uncovered most of Arsenal’s early history, I have seen a lot the original materials, and I’ve never seen anything relating to the Archbishop. The land that Norris bought from the religious college was not C of E land, but from a college that trained up working men for work in the church. But the CofE changed the rules meaning that its ordained clergy needed to have degrees – meaning those ordained by the college in Highbury couldn’t get work so their numbers were down. I do know for sure, and we established this clearly in the Woolwich Arsenal book with reference to the minutes of the AGM of the Football League in 1910 was that the League made it very clear at that meeting that their rules at the time had no provision for governing where a club played, only what division it played in. Now if you have evidence on any of these matters please do put it forwards. Believe me we spent two years on the Woolwich Arsenal book, Mark Andrews spent a year on his volume “The Crowd at Woolwich Arsenal” and I spent a further year on “Making the Arsenal” which covers 1910 – all these volumes come to the same conclusion as to what was going on. Certainly Norris did work with the church over the oil depot scandal in Fulham in 1910 and that would have brought him closer to the church, but there is no evidence that he was given any particular benefit by the church nor that he knew the Archbishop. Don’t you want to play at your home? AFC Wimbledon Fans are fighting for their lives to do just that. Shouldn’t you put all your focus in ensuring you return to your South London Home in Woolwich? Neil Hughes – there are many teams that have moved in the course of their history. It is indeed a view that clubs should always stay close to their first ground, but it is another that says if the only way to survive is to move, then move rather than die. Millwall found it better to move from the north of the river to the south, and Arsenal found it better to move the other way. It happens. Didn’t Spurs try very hard to move to the Olympic stadium recently, about six miles from Tottenham, and even appealed against the decision to award it to West Ham United. What would you have said about that? Nigel yes indeed that is true, and it was covered extensively on Untold Arsenal. Would have been interesting if Spurs had have moved to the Olympic stadium whether they’d changed their name to Stratford Hotspur, Newham Hotspur or just to Hotspur, like we dropped the Woolwich when we moved!